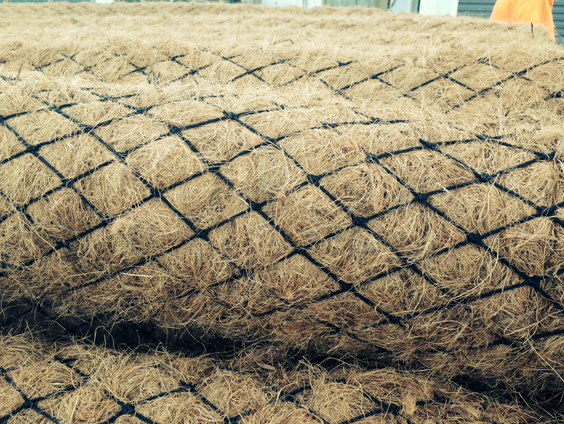 GeoLog coconut fiber logs are comprised of 100% biodegradable coir fiber tightly bound by a coir yarn netting which maintains its density & shields the structure against mechanical & hydraulic stresses. GeoLogs are deal for riverbank scour protection, silt entrapment, wave dissipation, runoff & stream diversion, spill containment as well as aquatic/wetland plant protection & buttressing on revegetation projects. Strength. GeoLogs are durable & remain structurally sound throughout the natural life of the system. GeoLogs withstand wave energies which often require ‘hard armour’ solutions. Filtration. Rather than providing an impermeable barrier, GeoLogs allow water transmission whilst trapping sediment, reducing turbidity in the main water body. Environmental. GeoLogs are made from natural fibres which degrade over time whilst encouraging natural revegetation for long term security & protection. GeoLogs systems do not require bulk earthworks or invasive site preparation prior to or during installation. Construction. GeoLogs are extremely easy & quick to install. Timber stakes driven adjacent to the units secure them in place. Feel free to consult our staff for advice on installation for each individual project. Cost effective. GeoLogs are significantly less expensive than retaining walls or rip rap protection. GeoLog installation does not require specialist labour or equipment & can be installed by a small inexperienced crew. Other erosion & sedimentation control materials are available from Global Synthetics. These include silt control fences, biodegradable & synthetic erosion control blankets, rock gabion & mattress systems, geotextile filter fabrics & silt control socks for use around storm water drains.